Sucralose is an artificial sweetener developed by Tate & Lyle that is 600 times as sweet as sugar. It is a modified form of ordinary sugar (sucrose) and contains no calories. Although the name Sucralose ends in -ose, it is not a basic sugar like glucose or sucrose, so the name is rather misleading, and this was perhaps by choice. It is usually sold as Splenda. It has a good flavor with little aftertaste. However, like most zero calorie sweeteners, it has a rather empty taste, and is quite different from ordinary sugar in this regard. It does not break down under heat and so is suitable for cooking and in processed foods. It has recently become the number one artificial sweetener in the USA. It has zero calories per serving and zero glycemic index. This makes it suitable as part of a diabetic diet. Also it is harmless to teeth. However products such as Splenda contain sugar bulking agents, such as Maltodextrin which is a high glycemic carbohydrate. Splenda is not really suitable for diabetics. One packet (1gm) contains 3.3 calories and is as sweet as 16 calories (one teaspoon) of sugar. So Splenda contains 20% the calories of Sugar, and approx 30% of the glycemic load. This is well worth considering as, for example, a cup full could be well required in certain recipes. Like Aspartame, people have been reporting side effects. While not as severe, the list is nevertheless worrying and includes rashes, cramping, dizziness and bloating. Critics do warn against this product, but mainly it seems, because they are inherently suspicious of anything artificial. (Just because something is natural it doesn't follow that it is safe, and visa versa!!) Some people have no problem at all while others, a small proportion, report strong side effects. It was, together with Neotame, the only artificial sweetener to be endorsed by the consumer group Center for Science in the Public Interest. But in June 2013 the CSPI downgraded it from safe to caution citing concerns regarding recent testing. Details here. They also cited tests carried out in 2008 which indicated that Sucralose had an adverse impact on the beneficial bacteria in the gut. This has been reinforced by a clinical trial published Sept 2014. 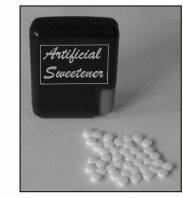 The study, carried out by two scientists in Israel has shown a link between the consumption of artificial sweeteners and metabolic problems. It was carried out on humans and mice and revealed altered intestinal bacteria and compromised glucose metabolism after relatively short trial periods. Also be aware of the extra sugars such as maltodextrin sometimes added as bulking agents to the products sold on the consumer market. Natural Health Sherpa has put together a good video on the side effects of this sweetener. The FDA has set a guideline Acceptable Daily Intake of 5 mg of the substance per Kg of body weight. For the average person this would be about 36 cans of soda sweetened with it - an amount which is unlikely to be exceeded! It is a modified form of Sucrose, produced in a chemical process. Despite the name sucralose (Ending in -ose like glucose or fructose) is not a sugar, and is not a natural product. Tate & Lyle have a large manufacturing plant in Alabama. However firms in China are producing quantities using older technology which has a more severe environmental impact. It is sold by Tate & Lyle as Splenda, which has bulking agents, usually maltodextrin. Although sucralose contains no calories, a cup of Splenda contains 96 calories because of the bulking agents added. Also sold as Nevella which contains probiotics. It is usually in the little Yellow Packets next to the sugar bowl. Other generic forms are available as Tate & Lyle no longer hold patents on early forms of production. On the commodity market it is one of the more costly artificial sweeteners, being about twice as expensive as aspartame. 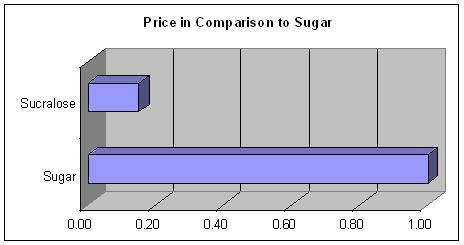 Nevertheless it is cheap in comparison to sugar costing about 15% the price for the same unit of sweetness. In 2012 it sold approx 1.7 million tonnes equivalent out of a total world market of approx 188 million tonnes. (Sugar was about 155 million tonnes) This would give it just less than 1% of the total market by unit of sweetness. By value it would be significantly less. It was discovered in 1976 by accident by two scientists working on a new insecticide. One of them asked the other to test the new substance just produced in the lab. The other, whose English was poor, thought he had been asked to taste it! He did so, and lived to report the sweet flavor. Sucralose is not an insecticide, it is a chemically modified form of ordinary sugar. Chlorine molecules are inserted into the sucrose molecule to alter its properties. It's status was downgraded on 8th Feb 2016 by the Center for Science in the Public Interest from 'Caution' to 'Avoid'. Approved for use in the USA in 1998. Approved in the EU in 2004 as E955. Somewhat better than Aspartame but side effects are being reported. Contains chlorine which is toxic. About 15% is absorbed by the body so it could be a cause for concern. It is harmless to teeth and zero glycemic. But Splenda is not as it contains Maltodextrin which has a very high glycemic index (105) and so is not suitable for diabetics. People seem to develop a liking for this sweetener, and in some cases consume large quantities on a daily basis. Not necessarily a good idea!